The most interesting aspects of Iran’s second presidential debate, on May 5, were discussions of the nuclear deal and a nuanced but obvious question about the Revolutionary Guards. 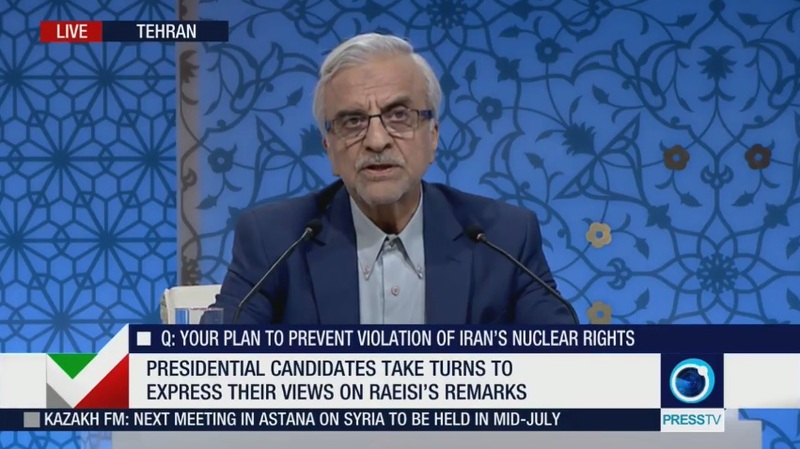 All six candidates implicitly supported the nuclear deal with the United States and five other major powers, which has been controversial inside the Islamic Republic. Even the two leading conservative candidates —Tehran Mayor Mohammad Bagher Qalibaf and mid-ranking cleric Ebrahim Raisi —formally committed to uphold the Joint Comprehensive Plan of Action (JCPOA), even as they argued that it has not yet yielded tangible benefits. President Hassan Rouhani called out hardliners for their seemingly newfound support of the nuclear deal. “If you agree with the JCPOA, why did you put up billboards insulting our negotiators?” he asked. 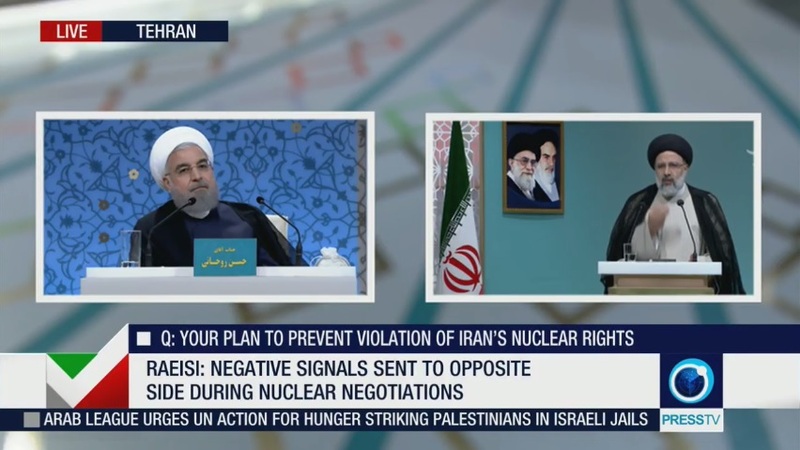 “What were you doing behind the scenes?” Rouhani said opponents moved in parallel with “Wahabbis, Zionists and hardline Americans” to challenge the deal. “When Donald Trump came to power, you were happy because he said he would tear it up,” Rouhani charged. 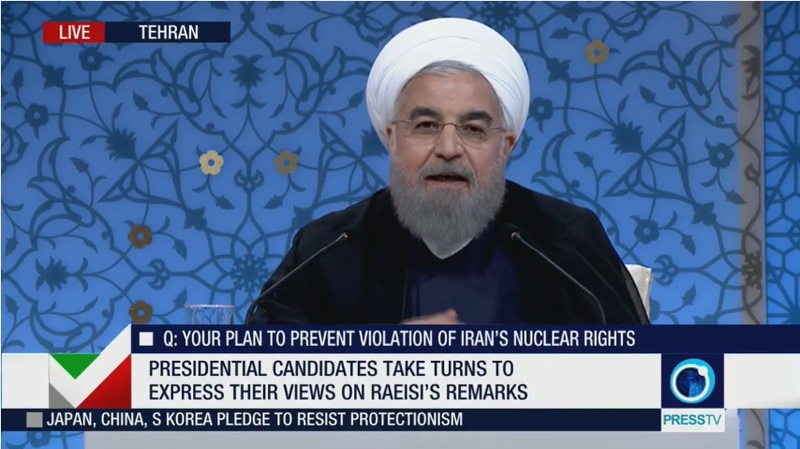 Rouhani even went on the attack in a thinly veiled jab at the powerful Revolutionary Guards, widely seen as bedrock support for conservative candidates. "We saw how they wrote slogans on missiles and showed underground [missile] cities to disrupt the JCPOA.” The Guards test-fired ballistic missiles with the phrase “Israel should be wiped off the Earth” written in Hebrew on the side. Public criticism of the IRGC is rare. Qalibaf is a former IRGC Air Force commander. 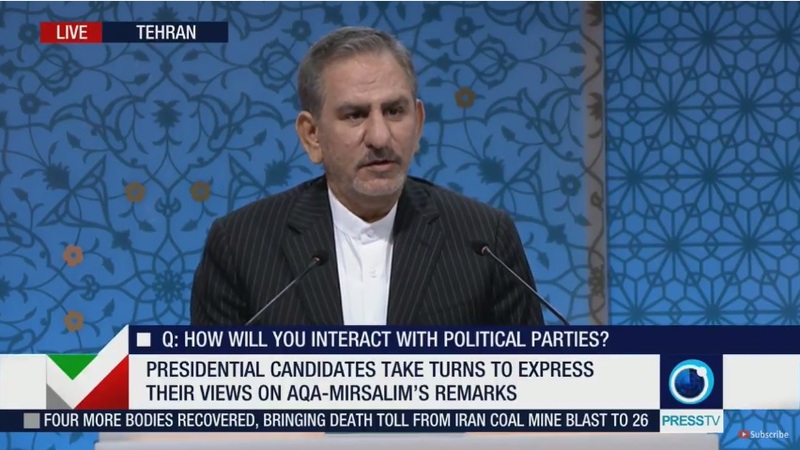 Rouhani and Vice President Eshaq Jahangiri, widely regarded on Iranian social media as the winners of the first debate, were not as well prepared for the second debate. But they held their own against Qalibaf, Raisi and former Culture Minister Mostafa Mir-Salim. 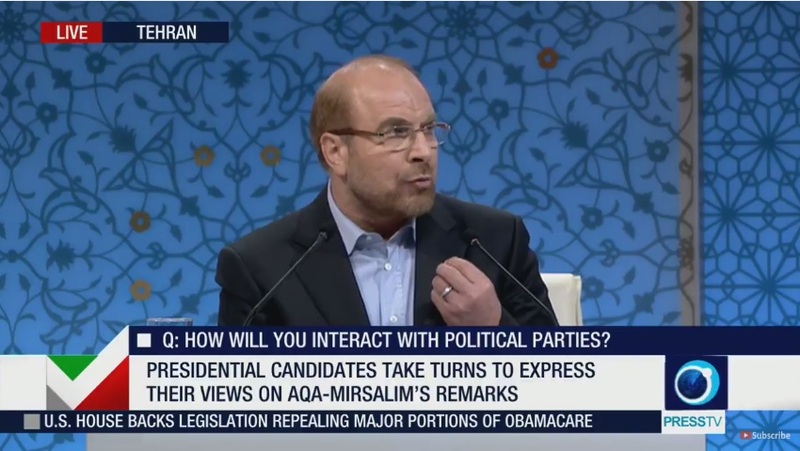 Qalibaf, who has run for president twice before, was the most outspoken of the conservatives. He repeatedly called Rouhani and his administration “four percenters,” a term he coined to suggest the incumbent represents only four percent of the population. 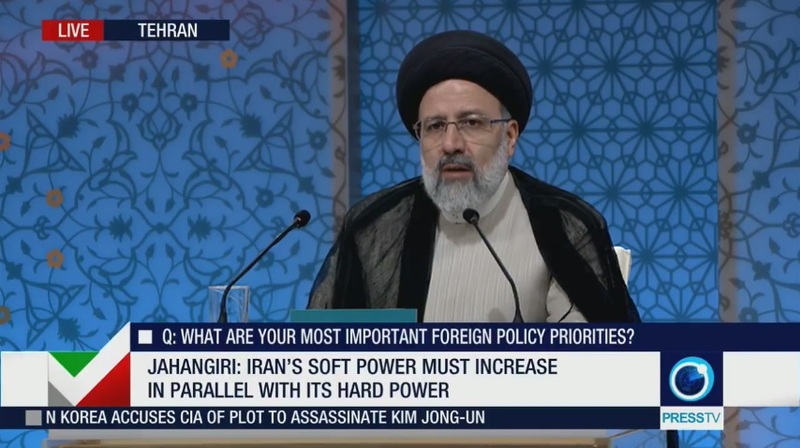 Raisi, who had been soft-spoken in the first debate, found his bearings and went after Rouhani, charging that the deal has not solved Iran’s unemployment problem. Mir-Salim, a former culture minister, challenged the ethics of government officials who hold run private businesses. In contrast, Mostafa Hashemitaba, a former vice president and industries minister, said the current government had endured a torrent of smear campaigns. Eight percent economic growth in the next five years is within reach. But promising 26 percent growth is a hollow promise. Oil exports have risen to 2 million barrels per day. Without the JCPOA, exports would be 200,000 barrels per day. Candidates should not create divisions among Iranians. Qalibaf’s assertions about the disadvantaged 96 percent and the top four percent are copies of the U.S. Occupy movement’s slogans. The top four percent of Iranian society is corrupt and causing inflation. Establish a ministry of foreign affairs and international trade, and the promote sale of Iranian goods abroad. Prioritize the economy in diplomatic relations. Iran should focus on exporting products rather than increasing European imports, which only has benefited the elite. The JCPOA should be respected and implemented by all governments involved, although it has not done much for people. Iran’s armed forces provide diplomats the space to negotiate. Rouhani’s government would not have been able to negotiate the JCPOA if it were not for Iran’s involvement in Syria. The nuclear deal has flaws, but Iran made a commitment to it, so it should be upheld. During the nuclear talks, the government put out messages that made Iran appear to be weak, such as saying that the treasury was empty. The JCPOA can be compared to a check, but the Rouhani administration is not competent enough to cash it in. Average Iranians have not seen their livelihoods improve and the banking system still is fettered. Iran must increase trade with its neighbors. For example, Iran has good relations with Iraq, yet Turkey is a larger trade partner. The JCPOA, without a doubt, was an important success. The “Iranophobia” that was prevent in the world has changed to “Iranophilia.” Now Iran is prepared for development. Thanks to the JCPOA, Iran has access to shipping insurance. Ships are bringing in foreign goods and exporting Iranian products. Soft power, especially through boosting tourism, is an important component of public diplomacy. Iran should be proud of its artists who have garnered international attention, including Academy Award winning director Asghar Farhadi. Iran should manage its relations with other countries with Islamic principles in mind and avoid confrontation with neighbors. But it must appear strong in the face of those taking orders from the “Zionists” (Israel]) and “arrogant powers” (the West). Iran should provide more guarantees to international companies to boost foreign investment. Citizens are summoned every day under some pretext for their online activities, which is not an effective way to administer justice. Empower people rather than interfere in their lives. Civil rights are not just words on paper. All Iranians should enjoy equal rights regardless of their faith, gender or ethnic background. The current government relaunched the national symphony orchestra, reopened movie theaters and increased opportunities for artists. Some minorities still do not enjoy the same rights as other Iranians. The government was attacked for installing a Sunni woman as governor. Rouhani should not suggest that the revolution is an impediment to citizens’ rights. Ethnic minorities enjoy the same rights as the majority and have attained high ranking positions in many provinces as well as in Tehran’s municipality. Citizen rights are more than just unveiling a document. All Iranians should be guaranteed freedom of speech and access to food. Citizens should feel free to speak their minds. We should not create an atmosphere in which people are afraid to raise criticism. The current government has granted 8,000 permits to NGOs while defending the freedom of the press and access to social media. People who consider themselves above the law should not be able to cancel a concert that had obtained the necessary permits. Ethnic minorities should all be allowed to maintain their mother tongues. Rouhani’s government has ministers and officials who simultaneously run businesses. Administration officials should serve the public only and not use their official positions for personal gain. Purchasing airplanes from foreign countries creates jobs for their youth, not for young Iranians. The family unit has weakened in recent years due to lower marriage rates and higher divorce rates. This has caused economic problems. Iran’s recent economic growth is due to oil exports, not Rouhani’s policies. The development of the southern oil and gas fields are not related to the JCPOA. The nuclear deal sent a clear message to the international community that Iran was not seeking nuclear weapons, but other parties have not fulfilled their commitments. The JCPOA has not benefitted Iran’s people. The government has shut down nuclear facilities and has not utilized researchers. Problematic content on the internet should be controlled, and social media can be a threat to society. The government is seeking implementation of the law that would make government spending more transparent. A Qalibaf government will be a meritocracy, and local officials in the provinces will be empowered. All candidates should release information on their personal wealth and that of their families. A government will only be successful if it accepts criticism from all sectors of society, unlike the Rouhani administration. The current government has insulted its critics using words like “inhuman,” “coward,” “extremist,” “reactionary,” “illusionist,” and more. Access to information is a right, and the government has a duty to provide the public with information as well.